They insisted I get on the table first. Ok. Wait. Why? Do I seem like I need it the most? Frazzled, exhausted, double shifts every day- it shows? I'm worse than the person living with cancer, the person grieving 3 loved ones, and the person in chronic pain? Well I jumped up on the table and felt rocked, safe, and loved. Felt like I was in the ocean, but supported, floating. Felt my angel. Felt my arms abducting and hoped I wouldn't hit anyone, but I couldn't help them moving inexorably away from my body. Felt my right arm shaking. Felt like a minute and they were done. I said, "Thank you very much," and tried to open my eyes. Soon I could. D said she saw a white horse. "Oh yes," I said, "my angel rides a big white horse and he was here." "Did I hit you with my arms?" I asked. I apologized. "I couldn't help it, moving them, and they were shaking." They stared at me. "Your arms didn't move." We all had a turn on the table. Shared Reiki tonight. Late this afternoon, I guess. Felt like night, since I usually get up at 5 am. This was 5 pm, end of another long day. Needed to orient a new practitioner, a lovely young woman who is passionate about Reiki and health. "I was stuck in a negative vortex," she told me. "Now I feel like I'm home." Home is our local cancer center. There is so much love, air, and light there. As I sat in the lobby, waiting for her to arrive I kept looking at the clouds, at the sky, at the river. Buildings, hills, and trees. Seagulls. It's on the 5th floor: a skyscraper in this town. I sat on a comfy couch and flipped through a shiny local magazine. Thought I should grade papers, so started on that. Felt sleepy so kicked back and closed my eyes. Worried about snoring, so sat up and wrote comments on student's paper. She arrived. 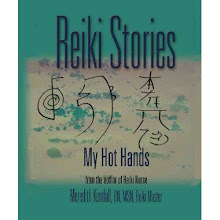 Our Reiki room was warm and stuffy, but when we placed our hands I got so hot I could barely stand it. I kicked off my shoes and shucked off my cardigan. Fanned myself, but that didn't help. When we started, I felt the Reiki pulses in my hands immediately. I checked the client: looked fine, relaxed and peaceful. I looked at the other practitioner and we smiled. The client snored. All is good in Reiki world. The snow melted, revealing the bases of the raspberry stalks. Many stalks were flat on the ground. I looked, and there were piles of chips, raspberry sawdust. There were pointy sticks, 6 inches high, and fallen spires. Who chewed on my raspberry bushes? Tiny beavers? Maybe mice. Maybe mice tunneled up through the dirt, under the snow, and felled the canes. Oh well. They needed to be thinned. A pen, because you always need a pen. A candle, because you are the light of the world. A shell I picked up on a beach in Florida: a shell to connect you to the ocean. A stone, because it is beautiful. And chocolate, because it's delicious. watching the basement for a return of the streams and puddles of 2 weeks ago. Have fan, dehumidifier, and wet vac ready to go. Fly up on your angel wings and look down on our beautiful Gaia. See the blue oceans, rugged lands. See the light from all our Reiki souls and lightworkers. Send love to consenting friends and family. Drift back down. Tried my new script at Reiki class tonight. Have a little problem with Reiki practitioners scaring the new clients. See, I offer this introduction to Reiki class. The students are a mixture of people who've never heard of Reiki, and Reiki practitioners. I found the practitioners were saying alarming things like, "Guilt causes cancer, what are you feeling guilty about?" "Reiki comes from other planets," and "Reiki angels work through me." "You won't need your medications if you try Reiki." The practitioners were scaring the potential clients. They were also being way too helpful in trying to teach my class for me. So I practiced scripts and methods to handle this situation. I came up with a script I liked and got to try it out tonight. This is what said. "Welcome new clients and experienced practitioners. 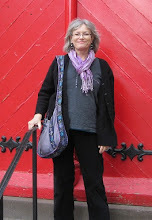 I invite the Reiki practitioners to listen to how I present Reiki here. If you have a different understanding of Reiki, then I welcome you to speak with me at the end of class." Seemed to work well, though I stumbled through the words. Luckily, the Reiki practitioners who happened to attend were people I respect immensely. They were gracious and understanding, and didn't seem at all offended. So, listen. No scaring the potential clients! Thank you. seemed like a good thing to do after work. Bundled up, trudged down, sat. Listened to birds and myself. Reconnected with nature, Reiki, and my better self. gorgeous heat from the sun, but arctic wind. I sat outside in the summerhouse, bundled up in boots, layers, and a warm sweater. The sun beat in, bliss. Then the wind came, brrrr. Wind chimes played their songs. The mud dried. I sat in the summerhouse and sent Reiki to my distant client: an emergency rescuer from Napa, California. I felt heat and energy pulse through my body. I felt twinges of pain in my left hip: me or her? I sent. I paged through a magazine: Sedona Journal, I sent more. I kept sending. Reiki. Second presentation was on radon gas. Excellent presentation, especially with the lemon cupcakes and caramel marshmallow chocolates. All hand/homemade. Radon. Odorless, tasteless, and toxic. Maine is high risk, related to our granite foundations. Can cause lung and other cancers. Cheap test - $20, and easy fix: basement ventilation. Get tested today. Test kits available at your local home improvement store. Took students to two wonderful presentations today. First one was ovarian cancer survivors. I learned a lot. Main symptom is persistent bloating. There may be abdominal pain which radiates to back and/or hip. There may be no symptoms. Physicians do not routinely screen for ovarian cancer. If you know a woman who reports persistent bloating, abdominal pain, and fatigue; please urge her to see a gynecological oncologist. You may save a life. Thank you. Water is still coming into the basement. There's a sweet little stream going west to south, and a big puddle at the base of the north wall. I guess it's time to haul my tired self out of this comfy chair and get out the wet-vac. I'll hose up the water and dump it down the basement drain. I'm running a fan and 2 dehumidifiers, but the humidity is holding at 65% down there. Time for the wet-vac. so the streams started up again. Lots of water in the basement. I sweep it to the drain. I had a dream this morning. Woke up and remembered it. Thought, "that was minor, not worth recording." So I didn't write it in my dream journal. Then the thing happened. The thing I dreamed. I thought, "wow." Thought, "should have recorded that." Now I don't remember the dream or what happened. is warm, dark, damp, and muddy. Or bright sun, yellow crocuses and daffodils, and emerging grass. Spring is floods, the possibility of snow, and hope. related to water in the basement. Let's just list them. Sending Reiki now to water, flow, fungus, and bleach fumes in basement. Nevermind. Just checked. Atmospheric chlorine is less than local swimming pool. Streams are probably diminishing. Feet still attached. Can breathe. Not perceivably electrocuted. All is good. Yes, they're beautiful. Yes, we like to possess them. But here's my question. Should they stay in the earth? In Gaia? Do they belong there? Or do they belong on our shelves and in our pockets? On our sandals and handbags? Are they responsibly harvested? Do they jump to the surface of the earth and say, "Take me home!" or are they blasted out with dynamite, hacked out with metal spikes, chopped, sawed, or clawed? I'm all about crystals. But I feel guilty. Shouldn't we leave them where they are? Why do we destroy and destruct our planet? Have I mentioned the grandma thing? A new type of love, a new way to be, the next unknown, and the next thing my son is showing me. Thanks, son. Thanks for teaching me how to be a parent. Now you and your son will show me how to be a grandparent. I had the best mother-in-law. What made her so great? She listened to me, she accepted me, she didn't judge, she helped in many ways. I hope I can be nearly as wonderful as she was. I'm learning to be a MIL to my two dear girls. I hope I do it right. I also had the best grandma. She's still with me. What made her so great? She loved me. Cynical, ironic, jaded: oh, I'm all those things and I bet you are too. I've seen suffering, deep gaping wounds, grief, and betrayal. So don't dismiss me when I write about love. It's real. And it's a new kind of love for me: grandson-love. There was a damp spot in the basement this morning. Took my shower and went to check on it. It was raining, snow was melting. I turned on a fan, left the light on, and went to work. Took a nice walk after work, so warm! Blue skies! Came home and explored the back yard: mud, sticks, snow, gotta thin those raspberries, more mud. Came in and checked the basement. A stream is running through the basement. The rugs are soaking sopping wet. Water. Well, it stopped raining this morning. The stream should slow down, right? I turned up the fan, turned on the 2 dehumidifiers, and left the light on. Swept the water towards the drain. Good. Oh, mold. Right. Went back down and dumped bleach around in the streams. Good. Came back upstairs. House reeks of bleach. I'm going to die, right? Opened windows, turned on fans, lit candles. The scented candles will dissolve or inactivate the bleach fumes, right? Or will provide the spark to ignite fumes and explode house. Blew out candles. Will go back and check stream in a few moments. Meanwhile, the bottoms of my bare feet look funny from walking in the bleach water. My feet are going to fall off. Hopefully after the house explodes and before I die of lung fungus. Too much work, coffee, sunshine, good books? 60 hours, decaf, spring but temps 20-50, Ross Thomas. Sun plastered me to the rock like one of those gel window decorations. You know what I mean, right? My coworkers decorate their office windows with colorful gel seasonal words and symbols. I don't. Who has the time? Do decorations really add to the quality of education? Enhance student learning and satisfaction? Am I supposed to redecorate my windows monthly? And my door weekly (inspirational sayings, puns, or family photos)? I like to poke the gel. Anyway. I went to the beach. Drove right in, noticed a park ranger fiddling with the chain at the gate so I waved. I have my season pass already, so didn't stop at the honor-system money-can at the empty toll-house. Drove right on. The road was smooth. The parking lot was empty and that was odd. It was a sunny Sunday afternoon and the road outside the park was lined with cars. The ranger pulled in behind me, driving a golf cart or 4-wheeler. "You're the first one in," he told me. "We just opened up, after mud season. It was a long mud season." "I have a season pass," I confessed, nervously, in case he'd stopped to check the money can. "I got it already, at Popham," I babbled on. "You must really like the state parks," he replied. "Oh I do. I love parks. Even when I travel, I go to the state parks." What was wrong with me? Why was I going on so, and to a total stranger? I'm usually a nod or one word to strangers. We awkwardly disentangled our conversation and I set off down the path to the bay, excited that I might have the small beach to myself. Oh. No such luck. Remember all those cars? People hiked in, with kids and lunches. Like I said, it's a small beach. A strip of sand and shells, then a line of seaweed and tricky rock, and then a steep cliff to tall trees. There were lots of people there. People watching, discussing, and photographing the ospreys. Kids called and cawed liked seagulls. Kids fell in tidepools. Mothers told kids, "Be careful! Watch your ankles! Don't get wet!" Was I ever that ridiculous and controlling? I hope I told them to go play, get wet, get muddy and sandy. I can't remember. A middle-aged couple in hiking boots were wolfing down foot-long sub sandwiches. Huge bites and chews. A hipster couple was oogling the osprey nest. There's an osprey nest on an offshore island. No trespassing allowed. Just ospreys. Young couples with kids. People with cameras. I felt inspected and trapped. I turned right to walk along the beach. I walked on muddy sand, shells, and seaweed. I walked past two women, planted on a boulder, eating lunch, and talking about working out at the local gym. "Treadmill..." I heard. "SO many INTERESTING people." Why were they shouting? A young couple was huddled in a cove. I kept walking. I jumped from rock to rock, avoiding the snails. I carefully tiptoed across seaweed. I walked in mud and sand. I found a stretch barren of people. I could still hear the hoots of the hikers in the woods above me. But I couldn't see anyone. The rock was black and glittering in the sun. The slabs thrust upwards. The seaweed was bright yellow and the shells were blue, white, and pink. I stopped and leaned against a slab, feet braced against small boulders. I felt the sun on my face, and slipped out of my winter jacket. It was sunny, windy, and 45 degrees. Almost summer to a Mainer. Sun plastered me to the rock. I felt sun and wind on my face. I could hear the wind and the waves. Snails dropped from the slanted rock and skittered down to the sand. I tried to nap. I thought about sun, Reiki, light, and heat. A family walked by, speaking melodic French. They found a boulder beyond, and sat in the sun, lulling me with language. I couldn't sleep so I watched the ospreys, in the distance now. I watched seagulls swirl above, like an electron storm. I saw a bird with black wings soar and startle the seagulls and ospreys. I saw circles of light flash and float among the gleaming birds. I don't have all the answers, but I'll help you start your journey. I'll witness, assist, facilitate, and participate. I'll walk some steps with you. Just for today... be Reiki. Students are discussing Reiki ethics and principles. We're in the last 3 weeks of our 17-week course. Students are writing final posts and papers. We have our last meeting next week, or maybe the week after. We'll share Reiki, do attunements, and say goodbye. Early in the week there were patches of ground visible, now there are patches of snow. Daffodil shoots are up. Snowpiles are shrinking. Goodbye, winter. Hello, mud season in Maine.